The frozen crust of Enceladus, Saturn's sixth largest moon, may hide subsurface water and perhaps even life. But scientists will first have to bore through the tundra to see what lies beneath and they may rely on the IceMole to do the digging. The IceMole is currently being developed by a team from the University of Applied Sciences in Aachen, Germany. This self-propelled probe measures 15cm x 15cm x 120cm and is outfitted with a dozen heating units lining the melting head. Each element warms to 77 degrees Farenheit and, by adjusting the output from each head, the probe can vary the rate of melting in front of it. This allows the drill to excavate up to three feet an hour and change direction mid-drill—it can even tunnel uphill. An array of ultrasonic sensors—which the probe will drag along behind like a series of detachable train cars—and additional help from the base station will help the IceMole spot obstacles before it begins digging. The bore head also includes a screw for penetrating mud and collecting samples for onboard analysis. If all goes according to plan, the IceMole will strike liquid water and be able to collect a sterile sample to test for evidence of microbial life. The IceMole is part of the recently launched Enceladus Explorer, or EnEx, project and is led by the German Aerospace Center. "Further engineering steps to achieve this goal are necessary, which can be performed within a further three to five years," he said. "We hope that the demonstration of the required technology will make a mission to Enceladus more interesting for ESA and NASA." 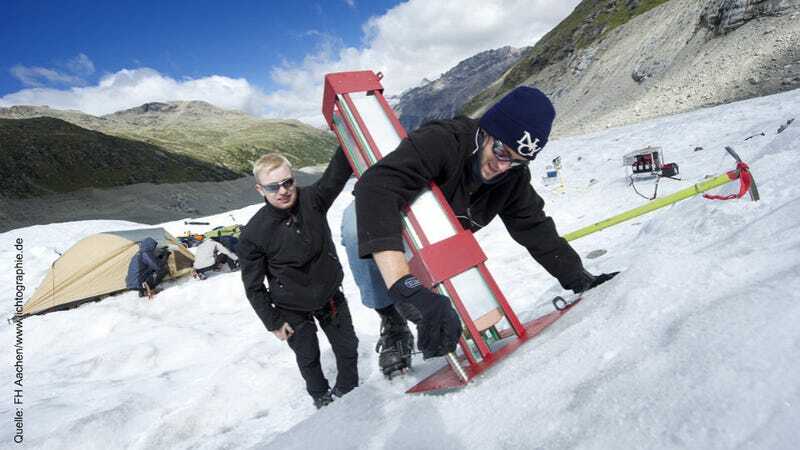 The team hopes to begin initial testing of the latest version of the IceMole this summer and work up to extracting a water sample from a sealed lake below the Blood Falls at Taylor Glacier in 2014. From there, it just needs to get to Enceladus.